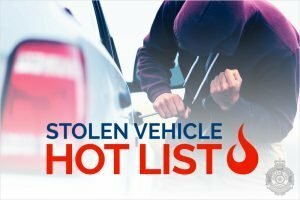 If a vehicle on the list is sighted please call Police Link 131 444– do not try to intercept the vehicle. We would also like to remind everyone to ensure that their vehicles are left secured at all times and that valuables are removed. Valuables include handbags, bags, laptops, tablets, keys, tools and mail.